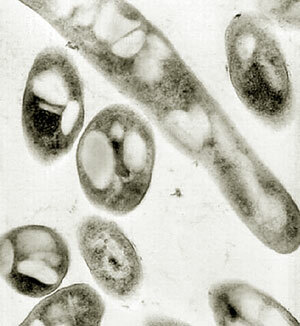 B.anthracis belongs to the genus of aerobic, immobile, gram-positive and to encapsulated spores. They have a very high environmental resistance and the spores are still infectious after years and decades. The growth achieved on simple nutrient media without hemolysis on blood agar. 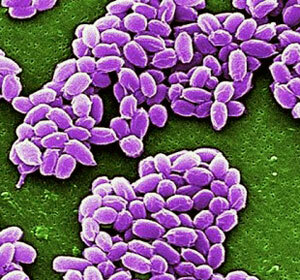 The causative agent of anthrax is common worldwide, in Europe, infections in humans are very rare. In Germany there was in the years 1996 to 2008, no message, and the disease was last here in 1975, a man who was on the consumption of meat and meat products suffering from anthrax sepsis and died unknown. Occur in animals (especially herbivores such as cattle, sheep, and in Europe), which Erdsporen record. The transmission is from animals or contaminated animal material (organs, skins, hides, wool, bone meal) to humans, but it is also possible from person to person! Transmission by insects is rare. Outbreaks in animals have been observed for example in 1994 in France (Pyrenees and Alps), 35 cows died in the Pyrenees. Three people developed after animal contact, the image of a skin anthrax, all were treated with antibiotics and survived. From Turkey anthrax cases (especially cutaneous anthrax) to a cluster of infections in the months of June September. Aerosols containing anthrax spores can spread over great distances and reach for their size of 1-2 microns into the alveoli and the use as a biological weapon is feared. In a release of anthrax spores from a bioweapons plant in Sverdlovsk in 1979 at least 66 people died in the U.S. in 2001 were a total of 22 cases (5 deaths) in individuals dealing with contaminated letters and packages. By a capsule form, the bacterial cell is protected from the immune system. Crucial is a toxin production [binary plasmid-encoded toxins: "lethal toxin", effective as protease (LF) and "edematous toxin" with effect as adenylate cyclase (EF), in combination with a Bindepotein (PA)] of dividing bacterial cells. The multiplication of the pathogen occurs at the infection site and draining into the lymph nodes. The most common form is the so-called cutaneous anthrax (malignant pustule, anthrax), with localization on the hand and forearm, but also lips (Webern), eye (from rubbing dust containing spores), neck and back by people who wear leather or fur, in the spaces between toes, under your belt or collar (chafing of the skin). The incubation period is 2-12 days, sometimes within hours. At the inoculation results in a painless papule with a surrounding edematous inflamed and subsequent blistering, painless necrotic center is within a few hours. You experience fever, dizziness and heart palpitations. Without treatment, a lymphangitis developed, with subsequent sepsis. The fatality rate in untreated patients is 5 to 20%, with therapy in <1%. Inhalation anthrax is caused by the inhalation of spores, the infectious dose must be relatively high (> 8000-40000 spores), to allow addressing the infection. However, there are also reports that the very 1-3 spores can cause disease. The period between exposure and onset of the disease is about four to six days possibly up to six weeks (! ), The spores persist for a long time (up to 100 days) in the macrophages. The disease begins after a short prodromal period (non-productive cough, sore throat, mild fever, muscle aches, headache) with a sudden high fever, chills and profuse sweating, and dyspnea, hypoxia, and tachycardia. Radiologically, a widened mediastinum is characteristic, infiltrates and pleural effusions. The mortality rate is adequate therapy is> 50-75% without therapy in nearly 100%. The gastrointestinal disease (intestinal anthrax) develops after massive ingestion of contaminated material in the stomach, often in the terminal ileum or in the Ileocoekalregion (incubation period from one to seven days). It caused up to 5cm wide ulcers with massive edematous swelling of the mucosa up to the obstructive ileus. Simultaneously, a massive fluid and electrolyte loss that can lead to death. Fever, nausea, abdominal pain, acute abdomen, vomiting and diarrhea (possibly bloody), and septicemia are accompanying symptoms. The fatality rate is 25-60%, the effect of treatment on mortality is unknown. 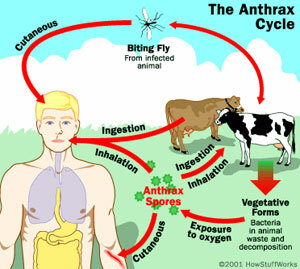 In all forms of anthrax meningitis is the development possible. If there is clinical suspicion of anthrax, the laboratory is essential to communicate by telephone. The investigation carried out by smears (malignant pustule), biopsies, blood, sputum, stool, nasal swabs from Va Exposure. Removal of smears with a damp swab under significant pressure and rotating the swab, and contact time of at least 10-15 seconds. Prevention measures are the avoidance of exposure (eg, reduction of animal diseases) and immunization (BioThrax R: Emergent Biodefense Corporation, Lansing, Michigan, USA). After exposure chemoprophylaxis with 2x500 mg / d ciprofloxacin (Cipro, etc.) up to 60 days (surviving spores in macrophages!) Plus immunization. In severe cases the therapy is with IV ciprofloxacin in combination with another substance, such as ampicillin (AMPICILLIN RATIOPHARM others), penicillin G (PENICILLIN GRUNENTHAL etc. ), meropenem (Meron), rifampicin (EREMFAT etc.) or vancomycin (VANCO-SAAR, etc.). See www.ndrugs.com for medications. Therapy should be carried out over 60 days, with adjustment of antibiotics in the clinical course. Prevention measures are the avoidance of exposure (eg, reduction of animal diseases) and immunization (BioThrax R: Emergent Biodefense Corporation, Lansing, Michigan, USA; www.emergentbiosolutions.com). After exposure chemoprophylaxis with 2x500 mg / d ciprofloxacin (Cipro, etc.) up to 60 days (surviving spores in macrophages!) Plus immunization. In severe cases the therapy is with IV ciprofloxacin in combination with another substance, such as ampicillin (AMPICILLIN RATIOPHARM others), penicillin G (PENICILLIN GRUNENTHAL etc. ), meropenem (Meron), rifampicin (EREMFAT etc.) or vancomycin (VANCO-SAAR, etc.). Therapy should be carried out over 60 days, with adjustment of antibiotics in the clinical course. In addition to inhaled anthrax may transfer a monoclonal antibody. In cutaneous anthrax, ciprofloxacin or doxycycline for 7-10 days, when penicillin G was tested to be effective, this may also be administered. Therapy in children (<40kg) 3x15mg/kg bw / day, amoxicillin (AMOXIHEXAL etc.). Obligation to report suspected by name, disease, death, and upon proof in the culture.